As a longtime wedding mobile entertainer, I find bridal shows to be the single best vehicle for advertising my business. I am also the co-producer of the largest bridal shows in my market, and my production partner is a wedding photographer. Brides have many choices from which to select the entertainment for their wedding. As a business owner, you have many options for where to spend your advertising dollars. They provide an opportunity to meet many prospects in a very short time. Where else could you be face-to-face with dozens or hundreds of brides and grooms to speak with them and answer immediate questions? Exhibiting allows you to showcase yourself and your company in an up-close, personal manner. People do business with professionals they like and connect with; you can show them you are that person. Bridal shows give you the chance to meet and network with other wedding vendors to create strategic alliances for cross referrals. Exhibitors are provided detailed contact information on the brides attending the show, for use in follow-up marketing efforts. Generally speaking, booking just one or two weddings will allow you to break even on your investment. Bookings over that amount can give you a good to great ROI. Booking just one wedding will create 2 to 3 times the cost of participating in the show. You cannot just “show up” at a bridal show and expect to be successful. You must create a booth display that is inviting, “screams” professionalism and style, and conveys what you do in about ten seconds. DON’T focus on taking deposits and reserving dates. DO focus on generating interest, obtaining a follow-up list and making appointments to meet with prospective brides and grooms by having your elevator speech (a quick 15 second presentation of your business) prepared. Make sure that your brochures and business cards are displayed along with any handouts. Just don’t give all of the information away about your DJ service so that people have a reason to speak or meet with you. Elegant signage is very important along with identifying your affiliation with the ADJA, NAME, ABC, etc. The biggest mistake most mobiles make after a bridal show is inadequate follow-up. Most DJs will call twice or even three times and then if the call is not answered or returned, give up. Don’t be one of them! Instead, realize that most people make their purchasing decision after the 5th contact, so utilize email, phone, letters and postcards to get to the booking finish line. Also, remember to make sure your materials are branded well and that your message is consistent to that your company can be recognized easily. Photo courtesy of Bedinotti Photo. 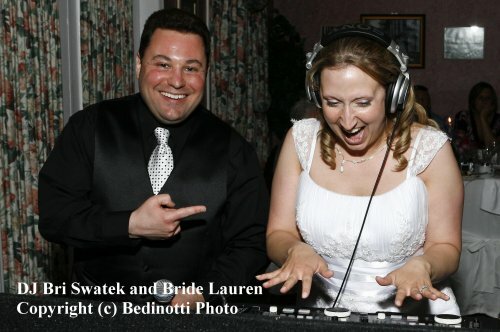 DJ Bri Swatek and Bride. What are your bridal show success tips? Alan Dodson is the Entertainment Director of An Unforgettable Event (ThoseWeddingPeople.com), and has been entertaining at and producing events since the early 1970’s. He has also worked as a voice talent on radio and television, nationwide. Alan specializes in weddings, and is a co-producer of the Tri-Cities Bridal Show (tricitiesbridalshow.com) as well as producer of bi-monthly workshops for grooms (aPerfectGroom.com). He has written numerous articles for business and trade magazines, and has been a speaker on implementing social media into wedding DJ businesses. Alan is a founding officer of the E. TN Chapter of the ADJA (adja.org/chapters/etenn), where he now serves as Secretary. He maintains an informational wedding blog on his website (TopDiscJockey.com). 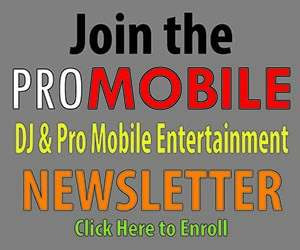 Alan can be reached by email at alan@topdiscjockey.com. View posts by Alan.